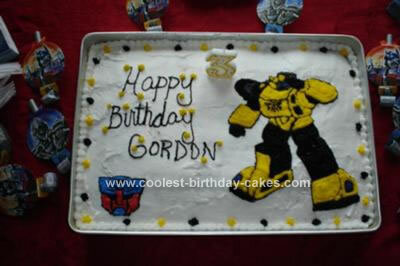 My son Gordon wanted a Transformer cake for his 3rd birthday. I started by Google searching pictures of transformers until I found one that I like. Originally I was going to do Optimus and Bumblebee but Bumblebee took me 3 hours to do so I settled with just a homemade Bumble Bee Transformers cake and decorated around it. I bought cake mix at the store and baked it the night before so it would have time to settle. Then I made the frosting using a bag of powdered sugar, 2tbs of vanilla, 1tbs of butter flavor, 3/4 cups of Crisco, and about a 1/2 milk. Then I put the frosting into a couple of separate bowls and added food coloring for the different colors. I frosted the cake white. I started bumblebee by doing a simple outline first by looking at the picture. A helpful tip for those who cannot draw freehand cut him out and lay him gently on the cake and trace then pull it off carefully. Then I just filled it in following the picture’s colors. After that I decorated the sides and drew an Autobot symbol in the corner.